On September 10, 2015, the anniversary date of its founding 250 years ago, Hennessy laid the cornerstone for its new shipping and bottling plant in Cognac. Dubbed Pont Neuf, the site will boost production capacity to 10 million cases a year. 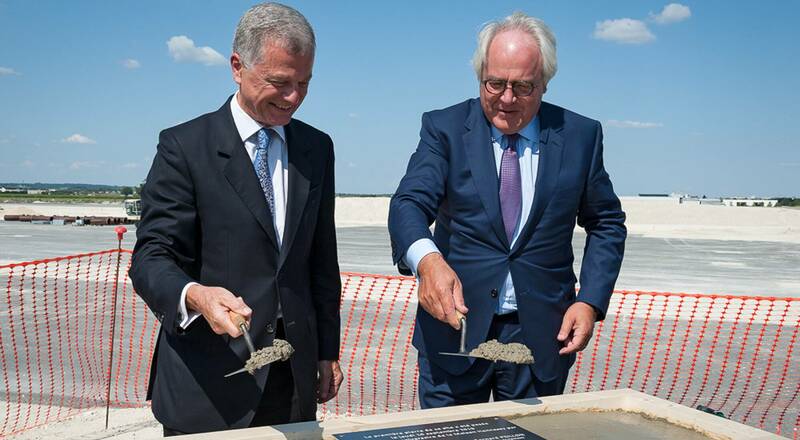 “We’re looking to the future with both humility and ambition,” said MoëtHennessy Chairman and CEO Christophe Navarre, who was joined at the groundbreaking ceremony by Bernard Peillon, CEO of Hennessy. Faithful to the values of conquest that inspired its founder, Hennessy is embarking on the next chapter in its proud history as the House celebrates its 250th anniversary. Hennessy recently shipped a record six million cases, and production will be able to reach 10 million cases in 2017 to satisfy growing demand from markets around the world. Designed by architect Jean-Marc Sandrolini, the 26,000-square-meter site meets unprecedented standards for a minimal environmental footprint and optimal working conditions. Rainwater recovery, LED lighting, natural light wells, algae-based paint and optimized temperature control contribute to energy savings of 50%. The site will have vast windows and open spaces, as well as enhanced acoustics to ensure the comfort of staff. The employees themselves selected the name of the site, Pont Neuf, a perfect metaphor for a House with a rich past that remains resolutely focused on the future.